“SKIBBEREEN.–In the parish of Kilmoe, fourteen died on Sunday; three of these were buried in coffins, eleven were buried without other covering than the rags they wore when alive. And one gentleman, a good and charitable man, speaking of this case, says–‘The distress is so appalling, that we must throw away all feelings of delicacy;’ and another says–‘I would rather give 1s. to a starving man than 4s. 6d. for a coffin.’ One hundred and forty have died in the Skibbereen Workhouse in one month; eight have died in one day! And Mr. M’Carthy Downing states that ‘they came into the house merely and solely for the purpose of getting a coffin.’ The Rev. Mr. Clancy visits a farm, and there, in one house, ‘he administered the last rites of religion to six person.’ On a subsequent occasion, he ‘prepared for death a father and a daughter lying in the same bed.’ Dr. Donovan solemnly assures a public meeting that the people are ‘dropping in dozens about them.’ Mr. Marmion says that work on the public road is even more destructive than fever; for the unfed wretches have not energy enough to keep their blood in circulation, and they drop down from the united effects of cold and hunger–never to rise again. The Rev. Robert Traill, chairman of the Schule Relief Committee, county Cork, states that 15,000 persons in that wide district are destitute; of this 5000 are entirely dependent on casual charity; fifty deaths have resulted from famine and “hundreds” are so reduced that not food or medicine can restore them! The deaths, he adds, now average 25 daily!! Ten additional deaths by starvation have occurred in the barony of gantry. The Jury at the inquests at Bantry handed in the following remonstrance, by their foreman, Mr. E. O’Sullivan:– “That we feel it our duty to state, under the correction of the Court, that it is our opinion that, if the Government of the country shall persevere in its determination of refusing to use the means available to it for the purpose of lowering the price of food, so as to place it within the reach of the labouring poor, the result will be a sacrifice of human life from starvation to a frightful extent, and endangerment of property and of the public peace . . . 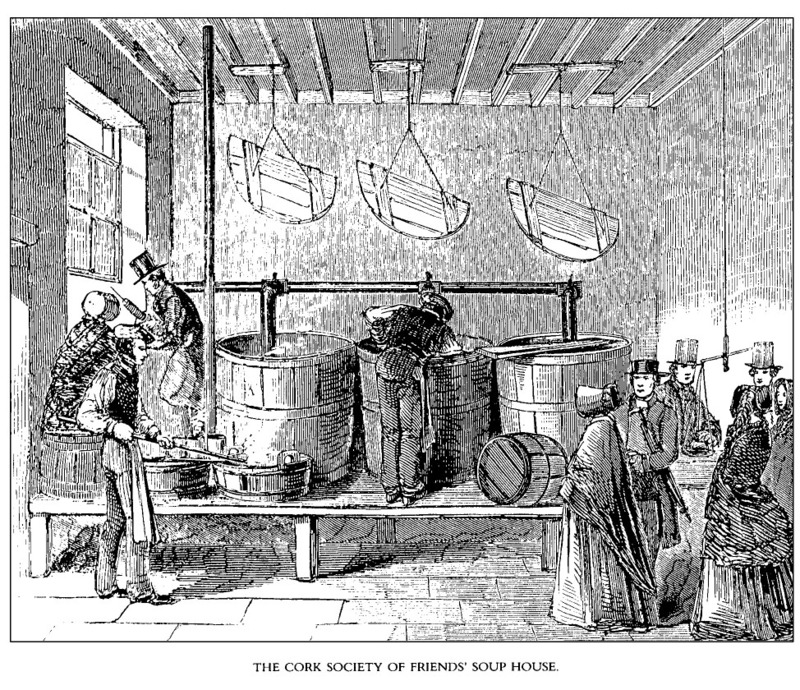 The Illustration shows a benevolent attempt to mitigate the suffering in the city of Cork, viz., the Society of Friends’ Soup House. There are many similar establishments in operation through the county; but, we prefer the annexed because the idea originated with the Society of Friends. The funds for its support are chiefly raised among this charitable class; and we are happy to state that the establishment is now in a position to supply 1500 gallons of Soup daily, at a loss, or rather cost, of from £120 to £150 per month to the supporters of the design. The present calls are for from 150 to 180 gallons daily, requiring 120 pounds of good beef, 27 pounds of rice, 27 pounds of oatmeal, 27 pounds of split peas, and 14 ounces of spices, with a quantity of vegetables. Tickets, at one penny each, are unsparingly distributed, on presenting one of which, each poor person receives one quart of soup, with half a small loaf of bread; and both are of good quality. engine, in an adjoining house; and, to ensure cleanliness, as well as sweetness, they are used alternately. Too much credit cannot be given to this establishment, and to the exertions of the Society of Friends in general; for, not content with originating these Soup Establishments, they have also raised a sum of money for distribution in the west, so as the more effectually to relieve the poor in distant districts.